The Sunday afternoon (Aug. 19) program on the Boston Symphony Orchestra’s 2018 Tanglewood calendar has loomed in anticipation since I filled out my summer concert list months ago, especially because of the rarity of the Bernstein selection, Three Meditations from Mass, for cello and orchestra, which has been performed at Tanglewood only once, in 1998, with Yo-Yo Ma on cello and Seiji Ozawa conducting. Excerpted from Mass, which he composed for the 1971 opening of The Kennedy Center, the Meditations for cello and orchestra was premeired there six years later, with Bernstein conducting the National Symphony and Mstislav Rostropovich on cello. This program opened with An Outdoor Adventure by Bernstein’s original Tanglewood instructor Aaron Copland, probably second only to Serge Koussevitsky in his importance to Bernstein’s development as a musician. Oh Man – Koussevitsky, Copland, Bernstein… sometimes it is hard to introduce a Tanglewood article without bumping into ghosts! 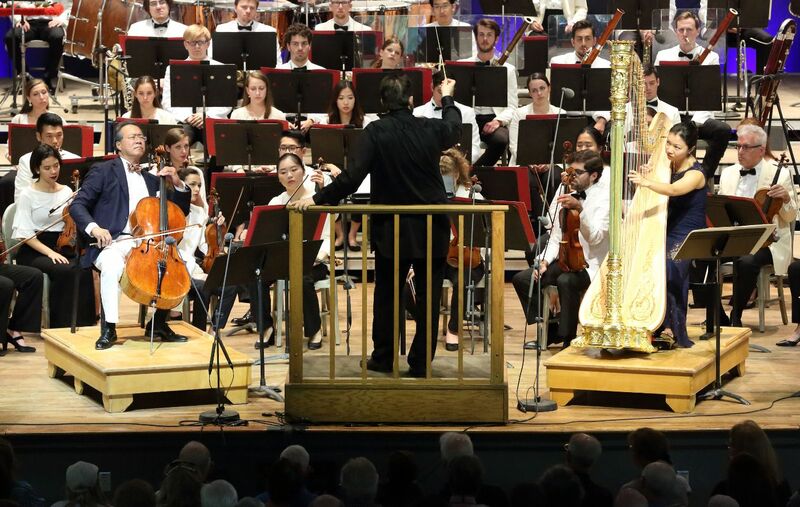 Nothing to be frightened about, so long as the orchestra on stage is comprised of Tanglewood Fellows, the women and men soon to matriculate from the Tanglewood Music Center into careers in the world’s leading orchestras. Fifty years from now, dozens of musicians in this orchestra will be delighting audiences in grand music halls and outdoor venues around the world. Time and mortality may be buzzkills in many settings, but they are key to the alchemy of music, our balm no matter the season – grief or joy. For all the auditory brilliance radiating from the stage today, I’m logging a visual memory – the apparition of Andris Nelsons and Yo-Yo Ma, following both Highwood’s Ghost and the Three Meditations, each acheiving a pose in assymetrical opposition to the other, becoming perfectly still, their gazees locked until sound had vanished. And speaking of the visual, after today, Highwood’s Ghost is my favorite John Williams film score! To hell with Hollywood, and Mammon’s other labs, a far more entertaining movie streams across the silver screen of the mind while listening to this latest addition to the Tanglewood canon. “Highwood is one of the grand old houses of the Tanglewood campus, which stands today with dignity and grace as it has since 1846. I well remember one night, as Lenny was making his way up the first stairwell, exclaiming “this place is haunted!” Coincidentally, I’m told that a number of people who worked at the house over the years have also felt Highwood to be haunted. In any case, it may be expected that Lenny, genius that he was, might have had a special ability to receive transmission from the sphere of spirits and signs. I thought a little piece about this history might be fun, and provide the unusual combination of harp and cello an opportunity to set the stage for an ectoplasmic visit. The program concluded with another piece particularly suited to be both a workout and a showcase for the student orchestra, Concerto for Orchestra by Bela Bartok – just as the 2012 The Leonard Bernstein Memorial Concert did, with the late Maestro Rafael Frubeck de Burgos conducting.